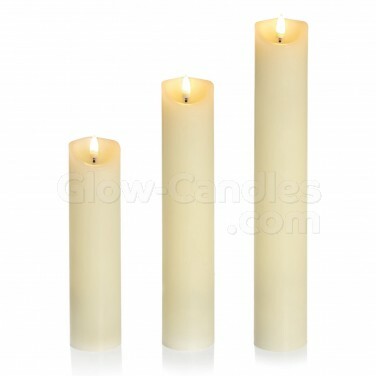 Enjoy candlelit displays with slimline Flickabright pillar candles for atmospheric candlelight without risk. Create realistic candlelit displays with slimline pillar candles with flickering LEDs and enjoy real flame effects without the associated risk. Made from real wax, these 5cm diameter pillar candles are available in three sizes; 20cm, 25cm and 30cm tall giving you the flexibility to create stylish candle lit displays without the risk. Battery operated, these Flickabright candles are perfect for use in even the busiest of spaces for a warm, peaceful atmosphere.